A Big Thank You to My OLLI Students! Will my unicorn play in Peoria? First of all, if the graphic wasn’t hokey and looked professionally done, I got it from Unsplash or Wikimedia Commons. I tried to credit the origin of each picture from either of these fine sites. The opening splash screen and a few of the early graphics were created in Adobe Spark, so no attribution supplied or needed. If, on the other hand, the graphic was just a bunch of crudely drawn blocks and arrows and the text was in Comic Sans, then I take full responsibility for creating those messes. For much of the material and narrative in the class I can’t really site every book or website I read. I can recommend a book that I finished recently, that I really liked: The Truth Machine: The Blockchain and the Future of Everything. I will also recommend two books that I read previously that I garnered quite a bit of wisdom from: Mastering Bitcoin: Programming the Open Blockchain and Mastering Ethereum: Building Smart Contracts and DApps. A good article to read about the history of the Bitcoin phenomenon is Joshua Davis’ piece in the New Yorker about his search for the inventor of Bitcoin. Of course, one of the best places to start when it comes to crypto-currency and even blockchain are the tutorials at Coindesk. Their Beginner’s Guide is one of the resources I used to cut my teeth on this blockchain thing and, so can you! The lessons are very accessible. Trading heroes also has a pretty good getting started guide to crypto-investing. Once you’ve been through Coindesk’s free courses you’ll probably want to head over to coinmarketcap.com to check out the crypto-currency markets. You can find more detailed information there about certain crypto-technologies as well as the marketplaces that will help you trade in and out of currencies. We talked, briefly, about Initial Coin Offerings, but I don’t think I had time to actually bring up icorating.com. This site will give you a heads up about specialty coins that are about to be released in the wild. There are plenty of lessons to be learned here about ICOs. The Ethereum Project and Foundation can be found at ethereum.org. They are loosely related to Consensys, which is an interesting set of applications spinning up on the Ethereum blockchain. Another interesting blockchain research play is the activity going on at Hyperledger. Hyperledger is sponsored by the Linux Foundation, but it has a bunch of high-tech heavy hitters involved in very visible projects. You’ll find out more about Ripple at their website, but also at their YouTube channel at: https://www.youtube.com/channel/UCjok1uTSBUgvRYQaASz6YWw. We spent a little bit of time talking about what I believe may be one of the most impactful blockchain / crypto applications yet. Brendan Eich’s Brave Browser and the Basic Attention Token. If you haven’t at least tried this browser, I think the time not spent on downloading ads and finding the real content on pages helps this free browser pay for the inconvenience of downloading and installing. I almost forgot the cryptomining demonstration software on my codepen. A crude but effective hands-on way of teaching someone the rudiments of mining. Thank you for attending my Blockchain class. I hope everyone benefited from the experience as much as I did. Feel free to join me on LinkedIn, Facebook or twitter. There is a well understood concept in engineering and project management called a trade-off. Because people work with limited resources, it is assumed that their capabilities are limited. This is true to a point. People can do so much with what they are given, and nothing more. The inevitability of a trade-off is a damaging lie, however. There is no such thing as two identical people. When it comes to the activities, like engineering, where this trade-off concept is commonly touted, even the same people aren’t the same people. Bob, the engineer, is going to perform differently than Bob, the engineer, depending on a multitude of factors. So when you limit your thinking to the paradigm of the trade-off, you close yourself off to the aspiration of “And”. The power of “And” is limitless and is only possible when people are concerned. I am sure you could find dozens of physicists and aeronautical engineers who could have proven on paper and in computer simulations that it was impossible to safely, and with no casualties manually land an Airbus A320 on a river. Before January 15th, 2009. On that date, Captain Chesley Sullenberger wasn’t thinking about saving as many people as he could. He was focused on saving all of them. Trade-offs were all around him and dominated his reasoning, I’m sure. But he wasn’t going to accept a less than optimal solution. 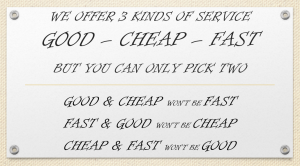 I saw a photograph of the “GOOD – CHEAP – FAST” sign illustrated above and considered how it sums up an experience I am having at this stage of my business venture. 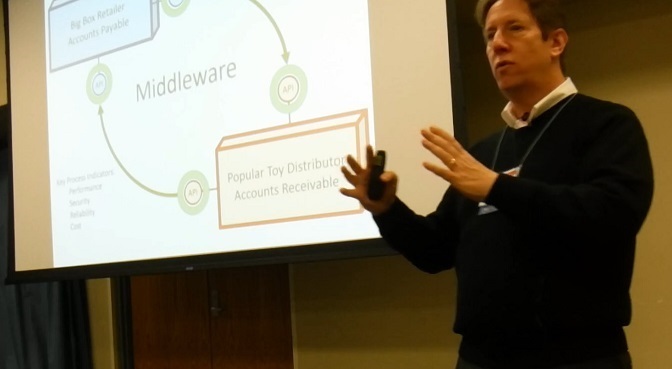 Middleware (the software that moves data between applications) is often confused with software and is often mistaken as being subject to engineering trade-offs. Its Key Process Indicators (KPIs) are the same as most software and even parallels the service industry as reflected in the above sign. These attributes are commonly regarded as trade-offs. You can have cheap, but it won’t be secure. You can have fast, but it won’t be reliable. All this pragmatic thinking gives people an excuse to accept less than optimal solutions to their data logistics problems. When I first retired from Caterpillar, I set about to discover some middleware that I could learn to use and build a consulting firm around. I decided to develop my own middleware platform because I am averse to trade-offs. I believe that the middleware that is Fast AND Reliable AND Secure AND Affordable has not been built yet. I am currently seeking people who believe as I do to join me in building the optimal solution, because I am sick of accepting trade-offs. I qualify for a ton of labels: solopreneur, techpreneur, seniorpreneur, etc. There is one thing I know I will never be. I don’t think anyone will ever accuse me of being a unicorn whisperer. 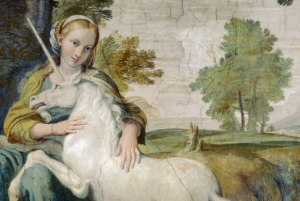 In the tech world, if you happen to have one of those really big ideas, people will sometimes refer to it as a unicorn. That just means its the one-in-a-million idea that breaks through the noise and becomes the business that solves a problem the world didn’t know it had. 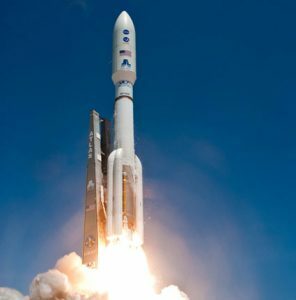 In the process, its value goes on to exceed $1 billion dollars. I don’t have a unicorn. I don’t even have a unicorn foal. But I do have an idea that comes from a unique (as far as I can tell) way of looking at things. If anyone is successful at implementing it, I am certain they would have a unicorn on their hands. But that’s the rub, “successful at implementing…”. I dare say that no one has ever developed a unicorn on their own. At Notionovus, we believe in diverse teams. It’s one of our core values. So, at this stage in my venture, I must build a team. I am looking for people who will understand the huge potential in my business model and recognize my ability to see the idea through. One problem; when I was very young, my Daddy Warbucks was hit by a train while simultaneously being struck by lightning. As a result, I had to be raised by my biological parents. The upside was a life I am happy to have lived. The downside is bootstrapping. Bootstrapping is the art of reusing paper (most people would throw away because it already has printing on one side) by placing the printed side up in the printer feeder. Bootstrapping is keeping the twist ties from packaging in a corner of your desk drawer because you never know when you are going to need a cable stay and won’t be able to afford the box of fancy plastic ones sold by Office Max. Bootstrapping is what every real lean startup does, because lean wasn’t invented in Silicon Valley. It was invented in post-World War II Japan from the ashes of their devastated industry. I’ve always wondered why “lean initiatives” cost firms so much money, when all you really need to do is take their money away and bury it someplace they can’t find it. They’ll either quit or go lean. Either way you’ve fixed their problem. But, I digress. The difficulty is I can only afford to pay my team members the same salary I have been paying myself since we formed our company. I am not at liberty to divulge that exact number, but I can say that if you have any bills to pay, you won’t like it. So what can I offer? Equity. Shares of what might end up being nothing. We’ve got a few things going for us, so far. We’re smart, we’ve got grit, and the idea is sound. What I know we need now are customer / investors. And that is where Peoria comes in. If we were based out of Austin or Santa Clara or Cambridge, I’m sure I couldn’t walk from one end of a bar to another without accidentally overhearing a snippet of a conversation about middleware. Technology startups thrive in such hotbeds of investment and talent. I love Peoria. I’ve spent most of my life here, and it has been very good to me. There is little to complain about the climate, the geography or the people of this fine metropolitan area. But I am getting strange reactions from some of the people I am interviewing for the Brave Launch program I have enrolled in. When the true purpose of my firm is revealed to my interviewees, they are often shocked by the scope and the gravity. On several occasions I am told that my idea is “too big for Peoria”. I hope they’re wrong. I would like nothing more than to have a unicorn spring up in central Illinois. I would love for my idea to transform the lives of hundreds of tech workers in the area. It would be fantastic if people graduating from the information technology programs offered in Peoria, Springfield, Galesburg, Bloomington / Normal, and Champaign didn’t feel like they had to move to Chicago, Minneapolis or Dallas to find work. Someone in central Illinois needs my help. Someone is currently confronting inter-application integration problems and is staring down the barrel of a dreadful choice: pay hundreds of thousands of dollars to fix it or let it fester and eat away at their business’ profitability. I represent a third alternative. We have a way of fixing middleware problems for pennies on the dollar for current commercial offerings. Our first few engagements will be rough. We are looking for Goldilocks problems, so perhaps the problem you identify that may help both of us is too simple or too complicated. Maybe it is too critical to your business or not critical enough. At any rate, Notionovus won’t find the perfect project unless we start looking for it. That search starts now. It seems like just a few minutes ago, I was talking about the recipe for success, right? The most successful companies in the Application Integration and Middleware (AIM) space have done what large software consulting firms have done. They go towards the money. Consulting costs money. Middleware requires consulting. The Fortune 500 requires middleware. They have money. It’s a win-win, right? What this strategy has led to is an industry that fights over the top 5000 companies world wide and ignores the bottom 9,995,000 companies that can’t afford to have their own IT department, let alone hire a team of integration ninjas to come in and build a custom middleware solution to connect their WooCommerce, QuickBooks and Salesforce accounts. The really expensive bit in the current middleware market is that huge up-front fee. Because middleware deployment is commonly modeled after software consulting and application deployment, middleware consultants use a traditional software development approach. This generally leads to custom deployments and customizations. This approach is not lean. In the book, Blue Ocean Strategy, by W. Chan Kim and Renée Mauborgne, the authors suggest an approach to rising above the fray (red ocean) and differentiating your product offering so much that you create an uncontested market space. In many of the examples in the book, a new market was defined because the innovating firms lacked the financial resources to compete head-on with the established players. That the challengers would be the most innovative may seem counter-intuitive, after all, the big companies have all the revenue and capacity for R&D, so let’s discuss a little further. Any very large company will pursue very large clients because their overhead makes pursuing the small fry cost-prohibitive. Any time you see a monopoly or near-monopoly serving a market, understand that there will be sales that can be made in that market to companies that the largest competitors won’t touch because they are too small. Monopolies get to be monopolies by serving everyone. To serve everyone, they have to grow to enormous size. Growing to an enormous size is inefficient in terms of revenue-per-worker. Overhead costs will mount to the point that only the largest customers with the highest margins look attractive. There will always be smaller companies with a lighter cost structure that will find smaller customers attractive. This is what I call my “Breadcrumb” theory. Not complicated at all. Ahh… The free market. It’s a beautiful thing. So, back to middleware. Middleware can be really, really expensive. So, if you sell hand made rugs over Etsy, and you use Xero accounting and you want to track your customers using Zoho CRM you may be forced to do a lot of manual integration. That is you may find yourself spending hours cutting and pasting and reconciling bank statements with customer orders to analyze customer buying habits. If you work in a company where the transactional cost to process an invoice is several hundred dollars, it may make sense to spend a few million dollars on integration automation. Chances are, though, if you sell handmade rugs, you can only afford a few dollars to alleviate this drudgery. Since leaving Cat, I have been on the lookout for companies with technology I can adopt in my Integration Competency Center as a Service (ICCaaS). There have been several middleware vendors who have broken into this space of integrating the systems of microenterprises. SnapLogic, Mulesoft and Zapier are good examples of companies which are modular in nature, priced reasonably and require little hand-holding. The problem with these and other current technologies is they lack automated interoperability. Automated interoperability is a fancy schmancy buzzphrase, so I’ll explain it like not everyone has an advanced computer science degree and has spent the last 30 years developing middleware. If you think of data like water, then middleware is plumbing. That’s why I call myself a data plumber. I help people control the flow of their data. If middleware is plumbing, then the simplest conduit is comprised of a connector or spigot joined with a pipe or hose and another connector that serves as an outlet like a sprinkler. For data, let’s say you have an accounting system like Microsoft Dynamics. You want your website sales from Shopify to automatically adjust your accounts receivable, inventory and general ledger. You’ll need a connector that has access to your Shopify account, another connector that can log in to your Dynamics system and some kind of pipe like the internet (hopefully a secure connection) to ferry your data back and forth. Two connectors and a pipe. In the data plumbing biz this is called a microservices-based connection. The problem with the AIM industry today is that every vendor wants to sell an end-to-end solution. If Interwebalytics Incorporated, a company whose name I just made up on the spot (apologies to any real company of that name), has the best darn Dynamics connector in the world, but they don’t have a Shopify connector, you are out of luck. If Manacle Software Industrials, LLC (another company name I made up just now, I also have a really cool logo for them) is made up of ex-Shopify gurus and they have an awesome middleware connector for Shopify, but they don’t have a clue about Microsoft software and they don’t want to learn, again you are out of luck. The only way a customer is guaranteed to get the best-in-class connectors and pipes for their middleware solution is if they can assemble them from components available from multiple vendors. This is what I mean by automated interoperability. If connectors and pipes from different vendors could work together seamlessly, that, ladies and gentlemen is the secret recipe for middleware success. I’m in a bit of a quandary. When I left Caterpillar three and a half years ago, I had one thing in mind. Start a business that addresses a huge pain. The recipe for success, right? My huge pain was technology-based. The recipe for success, right? This pain existed in a very large industry. The recipe for success, right? So my first order of business was solve the problem. And this is the problem. Integrating computer programs together is really expensive. Not just “Not on sale, today” expensive. Not just “Customizing your own car” expensive. But maddeningly-inefficient-beyond-belief expensive. 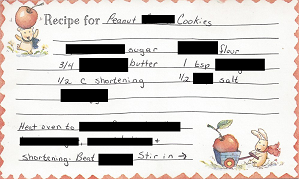 When a person wants to move data between programs, they “Copy” or “Cut” and then they “Paste”. This is called (derisively by many in the software industry) manual integration. Most of the time, using the clipboard goes well. If you happen to be cutting from a spreadsheet and pasting to a word processor, though there are many different ways this can be done, the results are close to what you expect. When a person wants to move data in a different direction, say from a word processor to a spreadsheet, or from a graphics editor to a database, things don’t go as smooth as expected. This is because applications have data models. They are built around thinking of data in a specific way. A word processor thinks about the data you type into it as a letter to someone, or maybe a book or a pamphlet. A spreadsheet thinks about data as information you want to perform a variety of analytic exercises with. A word processor then thinks that when you want to move information from another application you want to make it “visual”. You want to show other people “hey, look what I’m doing with this spreadsheet” or “look what I just drew”. But a spreadsheet has no idea what to make of that 12 page essay with mixed fonts, styles and graphics that you just pasted into it. Analyze what? So pasting something the wrong way tends to produce unpredictable results, simply because applications don’t think the same way about data. Now, imagine we are no longer talking about applications like e-mail, spreadsheets and drawing programs. Let’s start talking about the big applications that drive industry. Banking systems, healthcare systems, factory systems, human resource systems and engineering systems are good examples of what I mean by applications. These systems are just as driven by their data models, but the data models for enterprise-level systems are hundreds of times as complex as a pixel editor. So people accept that integrating enterprise systems is complicated and therefore expensive. But it doesn’t have to be. Once the solution has been developed to connect a human resources system with an accounting system, programmers don’t have to pay more to duplicate the solution. They can just install the same solution between the same two applications at another company. But they don’t. Current practices in the Application Integration and Middleware (AIM) market are to start a business engagement at a new company with a three step process. Pretend like you’ve never seen use cases like this before. Begin customizing the tar out of everything the company wants to use middleware for. Now, a lot of industry practitioners are going to say this is balderdash. They’ve never once rolled up their sleeves. I get that. It’s a bit of an embarrassment to hint that the AIM industry loves to customize data models. As a matter of fact, it might be a revelation to some. You see, we don’t do this consciously. We look at customer requirements and our creative juices start flowing. No two companies behave the same way. So, their use cases will always be different. My recommendation, as a customer, has always been to help us find ways we are similar to other companies with similar use cases. Please. Pretty please, with the least expensive sweetener we can place on top. You see, it isn’t middleware that’s expensive. It’s customization. And if your middleware consultant isn’t showing you ways you can change your own business processes and data models to more accurately reflect industry standards, you can save a lot of money by switching to a consultant who will. I left Caterpillar because I thought Caterpillar was just doing it wrong. I thought we had no clue what we were doing and we were letting bad actors from the AIM industry steer us into the most expensive way of integrating applications together. After I left, I started talking to people. I started researching integration hairballs and found out the AIM industry does this to everyone. And it’s for a very simple reason. The AIM industry has grown, from its infancy in the 1980s, into an industry just like the automotive or software or hardware industries. But it has nothing in common with those industries. It needs a totally different business model. And that’s the recipe for success. There are times when people choose a noble goal over a profit motive. These times often follow an occasion of hardship or an epiphany related to lifestyle choices. To be socially responsible always seems to require us to take it on the chin, to leave some money on the table. So often a social good is pitted in a life or death struggle against maintaining profitability. I feel that socially responsible causes that fail to embrace, or at least acknowledge the need of business to financially survive score only ephemeral victories. To truly help a cause, the most significant achievement is to link its success to the success of the businesses affected. Before I left Caterpillar, I took an inventory of my best and worst days. I cataloged the days where I was at the pinnacle of employee engagement and the days where I was wallowing in the trough of worker’s despair. In an effort to determine “What I love to do” I looked for similarities and differences between the categories. And I found it in the field of software integration. Whenever I felt elation, it was always as a result of getting two or more software systems to integrate in a seamless manner. Sorrow was always keenest when I was forced to watch the inexorable, slow-motion train wreck that was “traditional” (traditional meaning I was prevented from having anything to do with it) integration development as it presided over a facility transformation. I am a software integrator. A language translator for computer programs. I get my biggest charge out of successfully connecting two or more autonomous entities. For me, the true challenge is to develop apps in the asocial media space. This is the space where no human eyeball ventures, no human eardrum listens. This is the virtuality where computer programs talk with one another. It is the landscape of Tron. If you are not familiar with the franchise, I don’t recommend viewing the movies or TV series. The entire premise is fatally flawed. Computer programs do not speak English. To go further in my critique, they don’t agree on any language. In reality, using the Tron analogy, the ears and vocal cords would always be the last body parts added to most characters. And in most cases, these features would be dropped completely from version 1.0. I feel that my mission is to give computer programs their voices and hearing. I am like hundreds of thousands of software developers in that regard. The software industry is split pretty evenly. Half of the money seems to be spent building and maintaining computer programs, the other half is spent trying to connect them together. Unlike the hundreds of thousands of other software developers working in the integration space, however, there is something rare about me. I am not alone, but I am definitely in the minority. I am not satisfied with the status quo. In my opinion, the first thing that must be addressed when a program is developed is its external integration strategy. How will it talk to other programs? I believe this strategy is what determines how efficient the development effort will be. I believe this one approach can contribute to the elimination of waste, which accounts for nearly 50% of the cost of most enterprise level software transformation efforts. This is my noble goal. I want to see 90% of the cost of software integration vanish through identification of waste. I want to develop a solution for standardizing the language that computer applications use to talk to one another. I want to make it so easy to consider external integration first, that most software developers insist on it in their frameworks. I believe that the software integration industry is expensive, opaque, lethargic and fragmented. I want to assist in developing the standards that will drastically increase integration solutions’ speed, security, robustness and reduce its cost, all by a factor of 10. Well, it has certainly been a long time since my last update. I’ve been busy, but I keep forgetting to tell my fan(s) about my adventures. 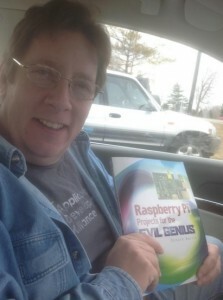 In March, I received my M3D 3D printer but didn’t get it in time for Pi day, where I went with my wife to a Raspberry Pi Jam in Columbia, Mo. 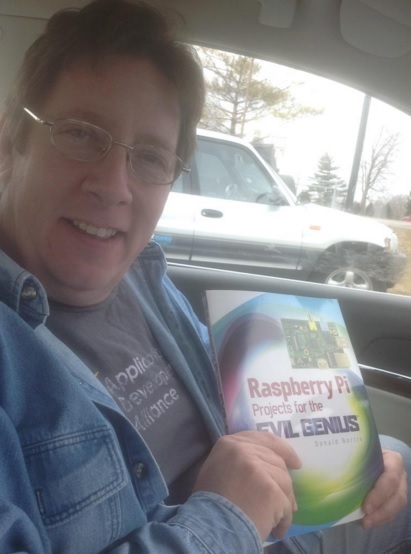 She was nice enough to snap a picture of me on 3/14/15 9:26:53 holding my Raspberry Pi Projects for the Evil Genius book. I am the new geek overlord. 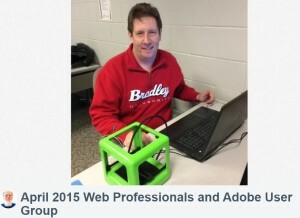 By April I had managed to unpack and get to printing and was ready to present at the April 2015 Web Professional and Adobe User Group meeting. After printing the Jigs for the 3 Pis, the Switch and the Power Board, I have a completed prototype. I’ll get a picture out a little bit later. That leads us up through April, and I don’t want to start talking about the major things in May yet, so I’ll leave you for now. Thanks for tuning in and happy [notionovus_barcode str=”barcoding”] barcoding. This is a repost of an article I wrote and published on LinkedIn. We’ve all used the terms train wreck, doom, tailspin, and death march to describe runaway software projects. While those involved might feel that a world of responsibility is crushing them, I think that might be a little melodramatic. Let’s face it: as IT professionals, we wouldn’t last a half hour on a real death march. In a recent post Dennis K. Berman added quite a bit of furor to the debate over whether IT departments should control access to technology. As a participant on both sides of that debate throughout my career, I’d like to weigh in with my thoughts on how this debate should end. 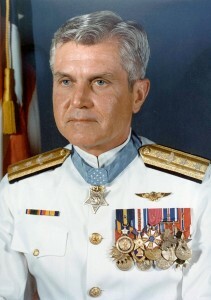 That is why I invoke Admiral James Stockdale. 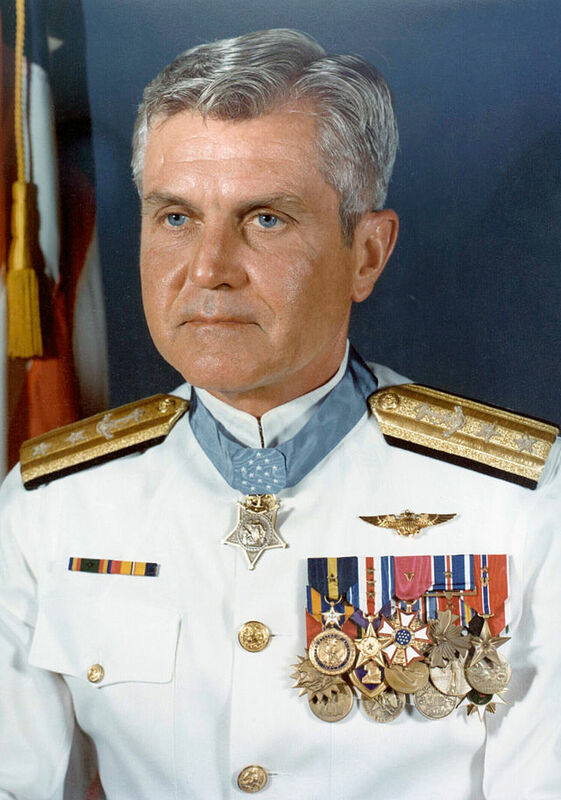 Admiral Stockdale was one of the highest ranking POWs in the Vietnam era. When asked by Jim Collins, author of Good to Great, what differentiated the POWs that made it through from the ones who did not, Admiral Stockdale replied the ones who made it faced the brutal facts of their existence, but had an unwavering confidence in the end game. This life lesson, called the Stockdale Paradox, has an application in this debate that rages between IT professionals and people who feel frustrated by IT. Here’s how I break it down. The first order of business is the brutal fact of the matter. Information technology will find a way into your perimeter. Whether it is your factory worker bringing a tablet in to help calculate heat treat durations, or the marketing guy who knows some outside people that can help him develop a killer sales app, we can take lessons from the whole BYOD phenomenon. There is a constant onslaught from outside your organization, and there is a constant pull from inside. I’ve seen this movie before. Disruptive technology and the drive to use it gets the girl. So, let’s face that brutal fact. While we may resist by putting up fences and writing memoranda, inevitably we are faced with integrating that pesky new technology into our system landscape. We are frustrated because we are reacting to it. Once we are forced to adopt it and take it under our wing, we have to take our valuable, limited time to learn the particular new risks and disadvantages. There is a common goal between IT professionals and their adversaries in this matter. Everyone wants to see the customer win. We stand on the verge of societal transformation more significant than the invention of the mechanisms that transport us and labor for us. Information technology is augmenting our senses and our cognitive abilities. Computational power enables us to extend our reach to places mere engines cannot go. It is a most exciting time, and as IT professionals, we are in the most exciting profession. It is not biologists that are sequencing the human genome. They cannot do that on their own. They need computers. Many very fast computers. It is not astrophysicists that are discovering life outside Earth’s atmosphere and outside our solar system. They cannot do that on their own. They need programmers. Many sharp programmers. Possibly more mundane than the technological heroes listed above, your customers have their own windmills and it is your duty to help them tilt away. Whether it is building social media applications or helping a company do more with less, it is our role to bring technology to bear on society’s difficult problems and advance the cause of our employers. We need to help the layman understand the risks involved and help them navigate an admittedly complex task. We cannot continue to stymie, stupefy and stifle. New technology will find a way to help our customers. It will be best if we are there to assist the transformation. Just a quick note to let everyone (both of you?) know that I am once again working out of my home office. The David street location was more space than I needed at this time and the anticipated growth of my company was premature. Also, I am beginning to revamp my website in earnest now and you will be seeing many more changes in the coming weeks.